Our Thermomix Vegetable Fritters make a great snack, easy meal or lunchbox treat! We love fritters in our house. They are such an easy recipe to put together and the ingredient combinations are practically endless (why not try these Broccoli Bacon and Cheese Fritters or these Sweet Potato Fritters) and they are the perfect way to use up leftover veggies. 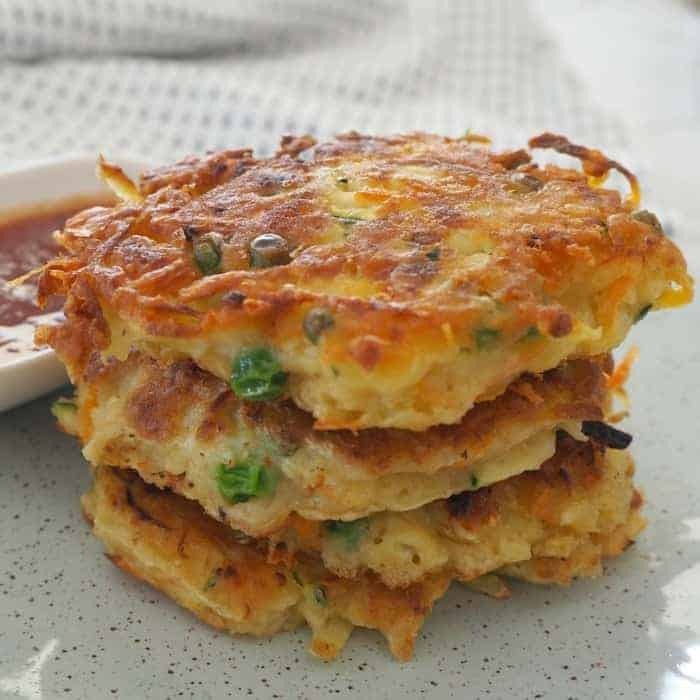 Although these Thermomix Vegetable Fritters are packed full of veggies, my kids still love them and don’t consider them to be filled with too many vegetables/goodness which I think is helped in part by the addition of grated potatoes which helps to give these fritters and almost hash brown like consistency. 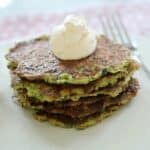 You can certainly alter the vegetables used in these fritters to help use up any leftover veggies that you may have, corn and sweet potato are two great options as well. When making these Thermomix Vegetable Fritters, just be mindful that you may not need all of the water as instructed in the recipe (or you may even need a little more) as the liquid content of the vegetables that you use will impact the consistency of the mixture. 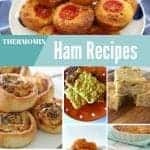 You can find more great snack recipes in this post and also in our Thermomix Lunch Box Snacks print book. These easy Thermomix Vegetable Fritters are packed with veggies and make a great light meal, side, snack and they are also perfect for the lunch box. They are also freezer friendly too. extra virgin olive oil for frying. Place the garlic cloves, parmesan and tasty cheese which has been cut into 3cm chunks into your Thermomix bowl and mix for 7 seconds on speed 9 to grate. Transfer to a separate bowl until needed. Without washing the bowl, place the potatoes, zucchini and carrots (all which have been cut into 4cm pieces) into your Thermomix bowl and mix for 4 seconds on speed 6. If you would like it grated into smaller pieces, mix for a further 2 seconds. Scrape down the sides of the bowl and add the grated cheeses and garlic along with the eggs, self raising flour, pinch of salt and pepper, onion flakes and 125g if water to your Thermomix bowl in that order – please note you may not need all of the water depending on the moisture content/size of vegetables used. Mix for 15 seconds on speed 4 REVERSE to combine the ingredients. Scrape down the sides of the bowl and if your mixture is still a little dry, add a further 75grams of water along the peas and mix for a further 15 seconds on speed 4 REVERSE or until combined. Heat a tablespoon of olive oil in a large frying pan over a medium to high heat and use a 1/4 measuring cup to scoop up the batter and place the fritter mixture into your pan. Use a spoon to gently spread the mixture into a circle between 1/2cm – 1cm thick. You should be able to fit approximately six fritters (or even more depending on the size of your pan) into your frying pan. Cook the Fritters for approximately 3 minutes on each side until they are crisp and golden brown before transferring to a plate and covering them with foil so they stay warm while you cook the next batch. Repeat until all the mixture has been used. These Thermomix Vegetable Fritters are freezer friendly. 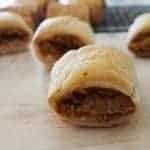 Hi – would these work as well with sweet potato? That’s a great idea, thanks Sue!